One of Lincoln’s much-loved Barons has had a change of scenery, moving from a busy shopping centre into the great outdoors. The Graduate Baron, sponsored by University of Lincoln as part of Lincoln Barons’ Charter Trail, is now getting some fresh air after being moved outside the Waterside Shopping Centre. Matt Corrigan, Chief Executive of Lincoln Business Improvement Group, said: “After lots of comments about the location of the Baron and people wanting to see him close up, I’m pleased that we have been able to make this possible. 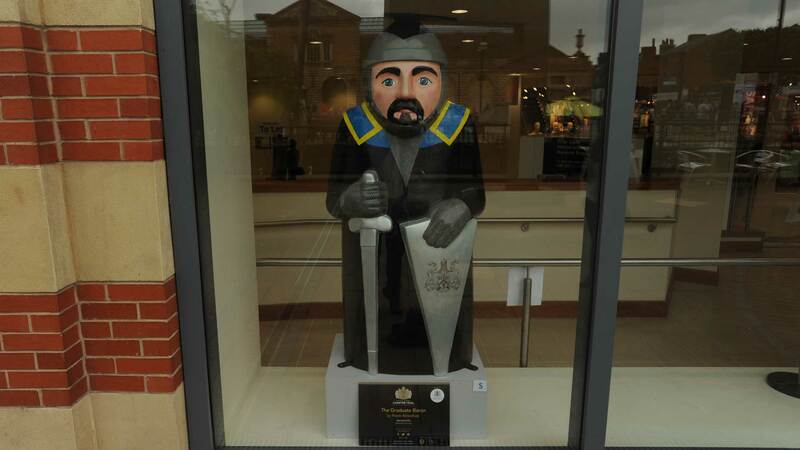 Prior to its move, the Graduate Baron was located inside the centre behind a glass window opposite H&M, overlooking Waterside South and Lincoln’s City Square. Chantelle Henderson, Marketing Coordinator at Waterside Shopping, added: “Baron 15 was a fantastic guest during his time inside the centre, but we completely understand why he captured people’s hearts and made them feel strongly about his release. The Barons’ Charter Trail was created as part of the 800th anniversary celebrations of Magna Carta by Wild in Art and brought to Lincoln by the Trussell Trust and Lincoln BIG, which runs until September 13. Following this, the 25 Barons will be auctioned off to raise funds for the trust, which aims to end hunger and poverty in the UK. A Facebook campaign to keep the Barons in Lincoln has generated nearly 4,000 likes since it was created just over a week ago.